You are staying in the old village in fully equipped quarters in traditional comfort among our family heirlooms. Relax in peaceful solitude or with friends and family. 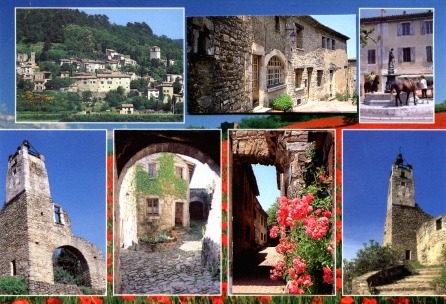 From the hilltop village it is a short walk down the road (1km) to La Bégude de Mazenc. The village boasts two bakeries where you can buy freshly baked croissants, crusty baguettes and mouthwatering pastries. There are two butchers, two grocery stores, a fruit and vegetable store, two potteries with unique creations, an antiques store, two hairdressers, a gas station, post-office, out-door swimming pool, pharmacy, flower shop, tourist office, restaurant and two cafés/bars strategically located from where you can watch the world go by. Every Tuesday is market day. For the food lover, colourful markets offer local produce, cheeses, cured meats, fish, fresh country breads... Fill your basket with honey, picodons (the local goat cheese specialty), virgin olive oil, vine ripened tomatoes, garlic braids from area farmers. Buy herbes de Provence, lavender essence or nougat de Montélimar made the traditional way, to take home. From the fresh ingredients create your own gourmet meal or indulge in the hospitality of the many restaurants in the area from rustic to world famous. The Côtes du Rhône wines of Grignan les Adhémar, Hermitage, Châteauneuf du Pape, Tavel, Vacqueyras, Gigondas, to name just a few, are a short distance away. Enjoy wine tastings at your leisure. Nature's palette of lavender, sunflowers and poppies are of exceptional beauty in season. The creative arts are a feast for the eyes. Visit ateliers and shops of the potters, painters, glass blowers, silversmiths, woodcarvers and silk painters. For refreshing physical activity play tennis, golf or join the locals for a game of boules, swim, hike, go horseback riding, bicycle or just walk the cobble stoned laneways of our medieval villages. We would be pleased to assist you to compile a sampler to suit your taste and inclination.